Also Called: Eastern poison ivy. Trunks: Stems climbing, clambering, or erect, spreading by underground suckers; branches often with aerial roots; bark gray, smooth to somewhat ribbed; wood yellowish brown, soft. Twigs: Light brown, pubescent, flexible; leaf scars crescent-shaped; buds brown, ovoid, .16 to .2 inch, scales tawny-tomentose. Leaves: Deciduous, alternate; petiole 2.4 to 8 inches, pubescent; leaflets 3: lateral petiolules .6 to 1.2 inch, terminal petiolule .8 to 2 inches; blade ovate to elliptic, 2 to 7 inches long, 1.6 to 7.6 inches wide, base truncate, often inequilateral in lateral leaflets, margins entire or irregularly serrate, dentate, lobed, or incised; apex acute to acuminate, abaxial surface light green, sparsely to moderately pubescent, especially along veins, adaxial surface green to yellowish green, glabrous or glabrate. Flowers: Inflorescences are axillary on current-year growth, lax to spreading or erect, panicle-like, narrowly to broadly ovoid, 2 to 4 inches, 10-50-flowered; peduncles .2 to .8 inch, pubescent; pedicels .04 to .1 inch, sparsely pubescent. Flowers unisexual, radially symmetric; sepals 5, connate proximally, green, ovate to triangular; petals 5, distinct, greenish yellow, ovate, .1 to .12 inch; staminate: stamens 5; pistillate; pistil 1, styles 3; stigmas 3, head-shaped. Fruit: July to September; drupes, cream to yellowish white, spherical, .12 to .2 inch, glabrous or with few scattered hairs, glossy; stone 1, yellow or yellowish white, spherical, low-ribbed. Habitat: Dry or moist woods, stream banks, pond and lake margins, roadsides, prairie thickets, shaded, disturbed areas. Toxicity: All parts of this plant can cause allergic dermatitis when in contact with skin. A red rash, blisters and itching typically occur within 12 to 24+ hours and can spread if the resinous oil is not washed off. Contact with contaminated clothing or animal hair can cause symptoms. Some people are more sensitive than others. One should immediately wash with cold water after contact. Comments: Poison ivy is dioecious and highly variable. It is shrub-like in open areas but but in woods climbs via stout aerial roots up to 4 inches in diameter. 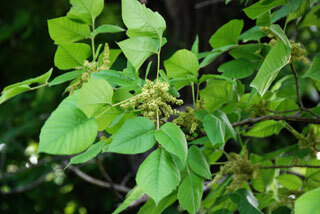 Toxicodendron rydbergii occurs in the west 2/3 of Kansas.